If you feel insecure or like you’re suffering a “social death,” then you are being ostracized. This is a tough blog to write. The problem is not what to write, but how to write about something that no one wants to talk about. That something is this: every human conforms to the acceptable standards of behavior of one or more groups, but almost all of us conform the most at work. It’s how we keep our jobs and climb the ladder. Don’t conform enough and you risk being ostracized like a black sheep, or out of a job. The need to conform exists in all organizations. Many employers in the newest sectors of the economy (think all shades of tech) market their workplaces as fueled by a diverse mix of disruptive, quirky, nonconforming innovators. It might be true if we compare one company to another, but it’s almost never true when we look at the people in one company. 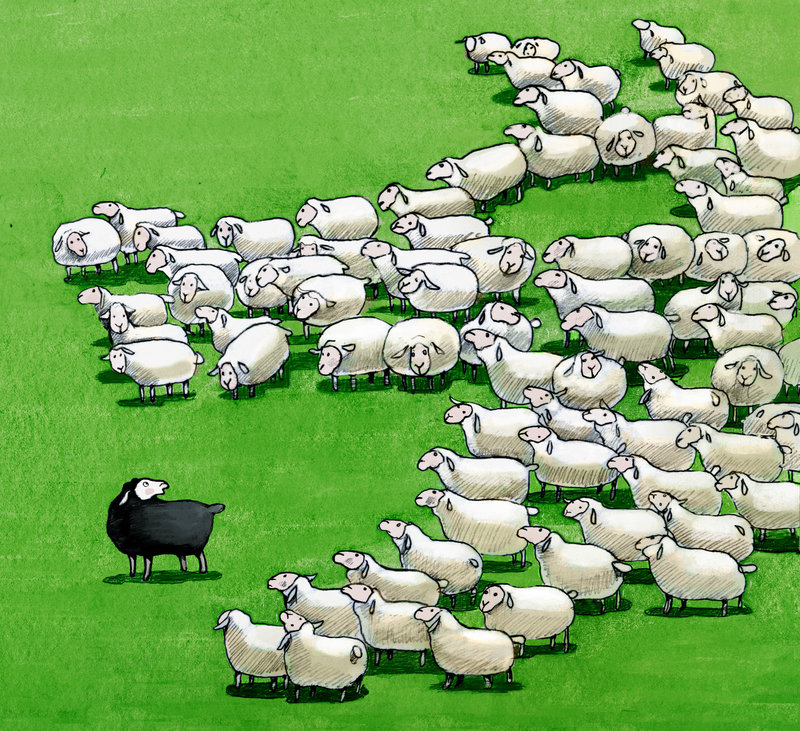 How do you know if you’re a black sheep? First, it’s important to distinguish workplace ostracism from systemic discrimination and harassment. Workplace ostracism is subtler than discrimination and harassment, although some organizations include ostracism in their harassment policies. They often call it exclusion, which is only one element of ostracism. Everyone has done at least a little ostracizing. It was first recorded in ancient Greece when people would vote to ostracize others as a form of punishment. Ostracizing begins when we ignore someone, or when someone feels ignored by you even when you don’t mean to do it. My article on Thrive Global talks a lot about the pain of being ignored at work. If you feel that you may have done something that is causing others to ignore you, and if this is causing you to feel insecure and like you’re suffering a “social death,” then you are being ostracized. It’s about how you feel, not what they may or may not be doing. Whether or not someone else is doing something, the outcome is the same. Ostracism has been studied in a variety of social contexts outside of the workplace, but workplace studies are starting to trickle in. In one, 13% of the 5000 participants said that they were excluded at work during the previous 6 months. In another study, 66% of employees said they were given the “silent treatment,” 29% said others had left the room as soon as they had entered, and 18% reported having been moved to an isolated location. Researchers have found that, not only does ostracism cause social pain, it threatens four fundamental human needs: our need for self-esteem, belonging, control and a meaningful existence. Think of that next time you’re about to ignore someone! It hurts when it’s happening. It happened to me and it has happened to many of my clients. The only advice I can give is to realize that you may never fit in that organization, but to then know that there is a place for you, out there, somewhere. There is a tribe for you. That tribe is made of people just like you. Commit yourself to finding that tribe and creating a world of work that is right for you. While you’re working to create that working life you’ll be standing alone, but you’ll have a deeply meaningful purpose. In 2008, while mountaineering in Peru, Tom experienced high-altitude cerebral edema. It was a near-death experience that changed him forever. He stopped working to only pay the bills and fund his hobbies, and soon discovered his personal mission: a world where everyone has the knowledge, skills and desire to build their own, joyful working life and create thriving organizations. He created WorkFeelsGood.com to fulfill his mission.